Listening & Learning; A Visit From Master Kanazawa. By Mike Clarke. 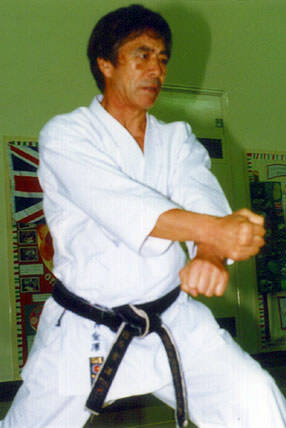 Sensei Mikio Yahara in Switzerland. Report By Bob Sidoli. 4th World Funakoshi Championships. Report By John Cheetham. Richard Amos 'The Hornet's Nest'. Interview By Bob Sidoli. Kawasoe puts Malta on the map. By Franco Azzopardi. Hirokasu Kanazawa 'Training with a legend'. By John Cheetham. The Obligation of Karate-do Defined. By Brian Fey. Welcome to the first edition of 1997 and issue number 50. 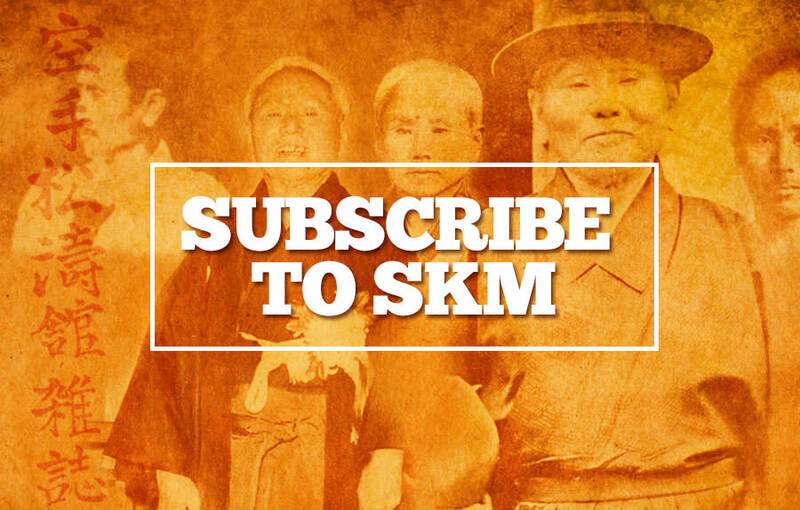 I never thought at the beginning that we would reach this far however, it is no exaggeration to tell readers, that S.K.M. is getting more and more popular with 'real' Traditional Karate practitioners all over the world. Something that really interests and fascinates me, is how people can interpret and explain the same subject/technique/ movement, in a completely different manner and attack the exact same theme from a different angle. For instance, how Franco Azzopardi describes the way Shirai Sensei uses hip/body vibration and the way Kawasoe Sensei uses the 'hara'. I found his descriptions enlightening. These are topics mentioned continuously in SKM by various people and each one approaches and explains the points in a variety of ways. It's like four people witnessing a car crash and giving statements to the police. They may give a similar account of the incident but you can guarantee that they will all interpret the same event in a different manner. 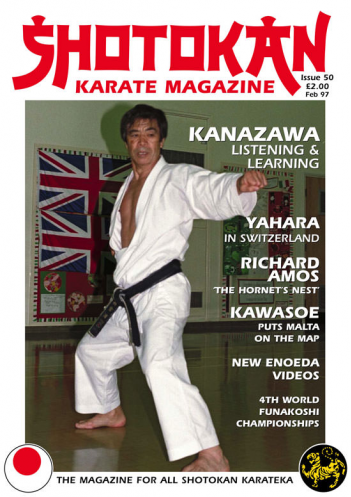 This issue is a 'cracker' featuring the latest interview (by Mike Clarke) with a living legend from Shotokan Karate, Shihan Hirokasu Kanazawa 9th Dan. I've been after an interview with British karateka Richard Amos for ages and at last we have one. This was conducted and kindly donated exclusively to SKM by Bob Sidoli. I think virtually all western karateka will be able to appreciate Richard's description of the life and hardships of a non-Japanese going into the veritable 'lions den'. He is I believe, the only (westerner) who stuck it out and actually graduated from the JKA Instructor's programme. It makes compelling reading and some interesting points emerge, both technically and regarding life in Japan in general. I have to say, it is a very honest interview, he's not held back, as might be expected. I've sort of had a change of heart with regard to 'occasionally' featuring the competition part of Traditional Karate. There is no question at all, that at the highest world levels, (not small regional events) standards within Shotokan karate are set. This has always been the case since the days when Enoeda, Kanazawa, Asai, Shirai, Shoji and all the famous JKA instructors competed in both Kata and Kumite and set world standards. I was quite pleasantly surprised by the very high standard shown by the young karateka from the 17 different countries at the 4th World Funakoshi Invitational Championships in Bournemouth. It is very easy to sit back and criticise competition, but just compare your own 'Kata' performance against a world class Traditional Karate competitor and you will discover some home truths! As for the Kumite, well, of course there are rules (this is sport) but the timing, spirit, speed and skill displayed by a world class fighter, both male and female is a majestic sight and great to watch. This is how all the previously mentioned masters started. Competition at this level is part of our great art, even if it is a very small part, and I think this is what Master Nakayama was trying to achieve through tournaments within Traditional Karate-do. Good training for 1997. Editor. TRAINING WITH A SHOTOKAN LEGENDHIROKASU KANAZAWA By John Cheetham. Kanazawa tirelessly performed every kata. Recently, I was kindly invited to a very special training course. Very special because the instructor was the legendary Hirokasu Kanazawa 9th Dan, the Chief Instructor to S.K.I.F. (Shotokan Karate International Federation). Also very special because there were only about 30 to 40 students training on the course, ranging from senior dan grades to junior (children) white belts. Thanks to Ray Wilkin who hosted the course in Blackpool, at the Sui Shin Kai dojo. The class started with Kanazawa Sensei himself doing the warm-up. The warm-up was very thorough and took a good ten to fifteen minutes. Kanazawa Sensei reiterated many, many times during the night that karate training has many benefits if done correctly. Promoting good health is one of them, through correct breathing and posture. With such a mixed class, we started with hip-movement in zenkutsu dachi (forward stance). (1) with both hands on the hips, turning/twisting from hanme (45 degrees) to shomen (square-on) both left and right leg forward, all for ten repetitions each side. (2) Then with left leg forward and left hand outstretched (tate shuto uke) and the other hand still on the opposite hip, we practiced using 'hikite' (the withdrawing hand) with the same fast hip turning action. This was done both sides. (3) Then the same idea but with the opposite hand in a fist position at the hip (normal punch position). Now, here is where many senior instructors differ, from what I have seen over the years. So, we are now about to do the reverse punch or as the American's call it, counter punch - gyaku zuki. Kanazawa Sensei started the action with both the hikite hand and the punching hand moving to roughly where both elbows touch the waist but 'no' hip movement yet. This was done in two counts first of all. The second count you slam your hip round with the punch - arms and hips together. We did this many times before practising the punch proper. However, as I said I've seen many variations on the start of this technique, this is one of them. An interesting kicking exercise followed. You both grasp each others gi sleeve (I don't like holding hands with some big, hairy black-belt) and at double arms length (side on to each other) both with feet together the exercise starts by.....(1) one side does yoko geri ke-age 'twice'(side snap kick) under the others arm keeping the kicking leg in a high knee lift position each time before returning the leg to the ground. (2) Then with the other (outside) leg you do two mawashi geri (round kicks) using a big hip turning action to either the face or body of your partner. Kanazawa Sensei stressed the importance of using the hips correctly for this exercise, like a pendulum action for the yoko geri ke-age and a big circular action for mawashi geri. Very simple but very effective. Next on to Kata. Heian Shodan first for everybody. Kanazawa Sensei shows everything and explains everything in great detail, I felt continuously, that here is a man who is trying to pass on real knowledge and 'his' system of Shotokan. After Heian Shodan everyone below brown-belt sat down and the higher grades were treated to what I can only describe as a 'Masterclass' on kata - Jion and Jiin. Kanazawa explained about the history of the kata and that Jion was the 'dai' and Jiin was the 'sho'. He said it was like, as if Jiin was in the shadow of Jion, slightly less important but still part of the same family. He used the word affection, like a family would. We went through both the kata in great detail before we were sat down and Kanazawa demonstrated both kata. Phew!! Magnificent, beautiful, no other words come to mind. There is always something different to learn. For instance he explained that many times in the various kata, there are movements where you stop or pause for a fraction of a second - focus point. Whereas in actual application there would be no stop or pause, the moves would flow together and follow on. Kanazawa gave a very good example from the kata Jion. If you know Jion, it is where the jodan juji uke (X block) occurs. In the kata there is a slight pause after the kime (with the juji uke). He explained and demonstrated with John Wise ( a senior student) that in application, the next move would follow on and is part of the same movement. e.g. You block the jodan punch with juji uke (right fist infront) and immediately sweep away the punching fist with your left wrist, simultaneously attacking with uraken. Exactly a the kata dictates. "Hips for technique, Hara for power, Breathing for health." He actually explained why he did certain moves in the Shotokan kata slightly differently now from how he had been taught at the J.K.A. For example in Jiin he does the gedan barai and uchi uke (double block which occurs several times) the opposite way around to the J.K.A. He does right arm uchi uke - left arm gedan barai, because he said that it felt and seemed more 'natural' and a more direct movement to flow into the next technique. A good example being the move before you spin into kiba dachi with tetsui uchi (hammer fist strike). If the right arm is in gedan barai position before the spin, you don't have to do any extra arm movements or adjustments (as with uchi uke) to make the next technique (tetsui uchi). I thought that made very good sense. Everything Kanazawa says or explains technically makes sense, the man is a karate genius, no question about it! After spending time with the dan-grades and brown-belts, the other kyu grade students were up again for their kata practice. He split up groups of the various grades and designated a senior black-belt to go through the kata with them, while he walked around and 'fixed' people's posture, technique, stance etc. in the various groups. I had the brown-belts for Bassai dai. The same format for kumite but the S.K.I.F. have a set (kumite) grading system for each grade and I did not know the S.K.I.F. brown-belt syllabus, so I took the white belts for Gohon kumite which is the same worldwide. There was to be a grading examination after the course. Everyone was then sat down again and Kanazawa Sensei went through every Heian kata, Tekki Shodan and Bassai dai in great detail. For me, this was pure pleasure. He is trying to make the students not only see the techniques done correctly but to try to make them understand and capture the feeling and spirit of each kata. We are blessed to have such talented instructors.